Examples, solutions, videos, worksheets, stories and songs to help Grade 8 students learn how to construct an angle bisector. 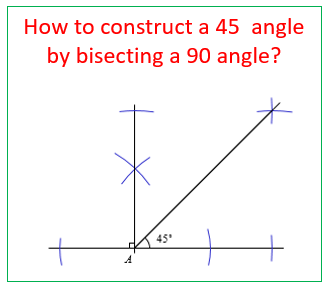 The following diagram shows how to construct a 90° angle and then how to bisect the 90° angle to obtain a 45° angle. Scroll down the page for more examples and solutions. How to construct an angle bisector using a compass and straightedge? An angle bisector is a line that cuts an angle into two congruent parts.